5 Galleries & Sculpture Gardens in one place showcasing Local Artists: Pottery, Glass, Jewelry, Paintings, Sculpture, Mugs, Cutting Boards, Dyed Silk, Wall Reliefs, Assemblage Art, Woodwork, Prints, Photography, Art Cards, Crazy Birds…and more! Voted 1st Fri Art Walk: Most Fun Gallery! In April, we’re featuring our Associate Artist members in the main gallery. We’ll have acrylic paintings by Suzanne Etienne, hand-dyed scarves by Connie Simonsen, and weavings and encaustic paintings by Angelique Stewart. Our member artists will also have lots of new work to show in our other galleries, including outdoor metal pieces that are perfect for your Spring garden, along with new paintings, ceramics, woodworking, and jewelry. Come out and meet the artists at the First Friday Art Walk! Rodeo Flyer will be playing some great music, and we’ll also have some light refreshments. 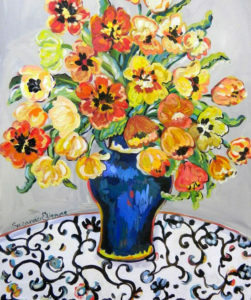 Suzanne Etienne is an acclaimed beloved local talent. Her artistic passions lie with the abundance and beauty of Rogue Valley gardens, farms, and vistas. As a seasoned traveler and joyful explorer of the world’s sweetest corners, it is no surprise that her paintings are living in award-winning architectural homes from Palo Alto, San Francisco, and Napa up the coast to Seattle, Vancouver, and Victoria, BC. Her many years as a go-to San Francisco Bay Area interior design and gallery owner paved the path for her unique gift and fine eye for living with beautiful art that makes a room sing. In her work, whether it is her colorful iconic rooster series or dreamy landscapes, there is the unmistakable impressionistic influence. 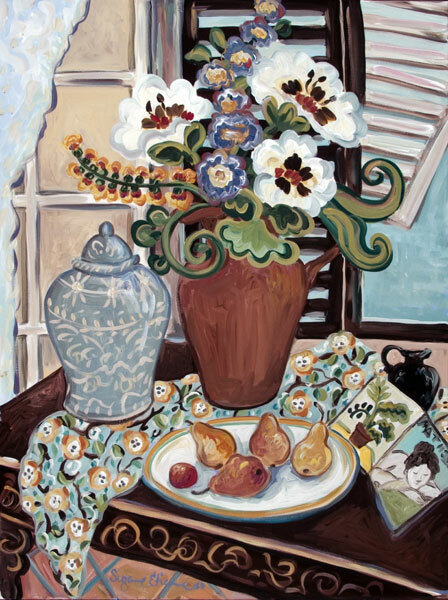 Connie Simonsen lives in Medford, Oregon and has been painting for 25 years. She is an award winning member of Silk Painters International (SPIN). Her work has been shown at the SPIN Festival in Santa Fe, NM; Mendocino Art Center in California; and at three local galleries. 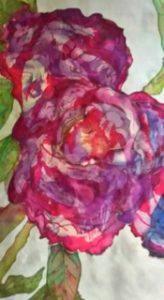 Obtaining her inspiration from nature, Connie expresses her vision through color, while painting in an abstract way on luscious silk. Finding symbolism from skies to earthy things like petrified wood to the depths of the ocean, all scenes have the potential to unfold the pristine imagery of nature. Angelique Stewart is a painter and weaver. 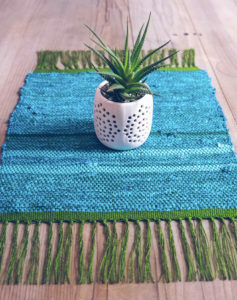 She weaves and sews elegant home decor that is made to last – like tea towels and table runners – and stylish, chic accessories, including scarves and shawls. She enjoys using high-quality organic materials and time-proven techniques, but with a modern sensibility. Her paintings are layers of encaustic and shellac on wood panel. The shellac layers are lit on fire so that the shellac burns off in a beautiful, unpredictable lacy pattern. Her paintings are abstractions of nature that evoke simplicity and serenity. She’s always looking for peace and that feeling of calm that can be elusive in today’s stressful world.